He showed early talent as a helm in the 420 class where he took third in the world championships in Travemünde Germany in 2014. Only the following winter he was the sailor selected to the prestigious Bretagne Credit Mutuel Challenge Espoir offshore training programme, following in the successful wake of Volvo Ocean Race winner Franck Cammas (1994) and Vendée Globe winners Armel Le Cléac’h (2000) and François Gabart (2008). While Simon celebrated, there was disappointment for top British solo racer Alan Roberts (Seacat Services) who compounded a tactical error on Stage 3 with another costly wrong decision very early in the final 24 hour sprint circuit. 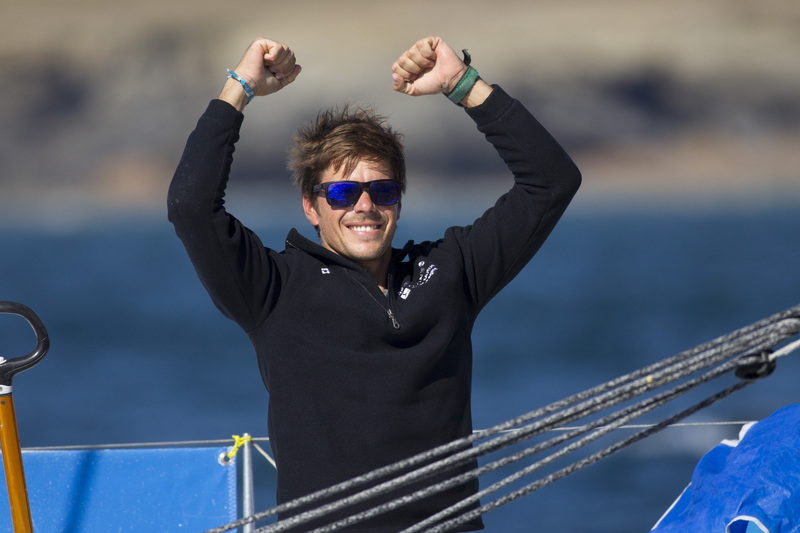 Both he and Hugh Brayshaw gybed offshore at the start of the first long downwind to Ile de Ré last night and paid a heavy penalty on a tight four sided circuit on which there proved to be no passing opportunities. Fifth on the first leg and seventh on the second, going into Stage 4 last night Roberts was 13th but – on such a course – needed to gamble to make any serious progress up the leaderboard. His choice, mirrored by Macaire and Eric Peron among others was on the strength of their forecast the breeze would be stronger offshore and a shift to a more favourable NW direction would come to them first. The breeze stayed resolutely in the NE and their race was largely over. Roberts drops to 18th at 2hrs and 26mins behind the winner after 10 days 16 hours and 39 minutes of racing. Roberts and finishes 24th overall 4 hours and 35 minutes behind the winner. Ireland’s rookies Joan Mulloy (A Taste of Ireland-A Seafood Journey) and Tom Dolan (Smurfit Kappa) finished 28th and 31st respectively, Dolan – like Cherry forced out of Stage 1 with damage.